Two box sets reveal the riches of two classic filmmakers with radically different pedigrees. F.W. Murnau has long been considered one of the great directors of world cinema and Kino’s new Murnau: A Six DVD Box Set introduces two rarities in beautifully restored editions and an astounding restoration of Faust. (The review follows later this week.) Hiroshi Shimizu, however, is practically unknown in this country. Travels with Hiroshi Shimizu is as much a discovery as a celebration of this marvelous filmmaker, and I hope it’s merely the beginning of a revival. Look up Hiroshi Shimizu on the IMDb and you’ll find 42 films made between 1924 and 1957 listed under his name. 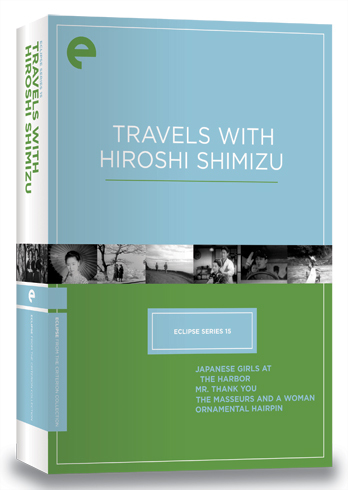 According Michael Koresky in the liner notes to the box set Travels With Hiroshi Shimizu (the 15th set from Eclipse, Criterion’s budget-minded label), he made over 150 films by most counts. That’s a lot of films for a director largely forgotten to time, even in Japan, but it isn’t the number of films that’s most alarming about his neglect. It’s the deftness and stylistic joys, the humor and humanity, the unexpected rhythms and a delightful stories on display in this set of four features. And the longest one of them clocks in at 76 minutes, although the term “tight” or “efficient” doesn’t seem to be appropriate to the generosity of his filmmaking. They are simply small stories, miniatures you might say, which unfold at their own distinctively wandering pace. The title Travels with Hiroshi Shimizu is perfectly evocative of the films, not simply because they are about characters in transition – a bus driver on a mountain road route, seasonal masseurs who are walking to their summer position at a mountain resort in the first scene, vacationers at a mountain inn during the summer in a momentary community – but because Shimizu as much travel guide as storyteller, taking us on a tour of people and places and the stories of their lives. The earliest film in the set (and the sole silent film of the collection), Japanese Girls at the Harbor (1933) is a lovely character piece about a pair of schoolgirls in Yokohama whose lives take radically different paths. Sunako (Michiko Oikawa) and Dora (Yukiko Inoue) look down on the harbor from their perch on high, wistfully watching the ships carry others off to adventures elsewhere. Sunako, however, is more concerned with her boyfriend, Henry (Ureo Egawa), a motorcycle bad boy who dallies with more modern, older woman whose western fashions suggests a kind of moral looseness. 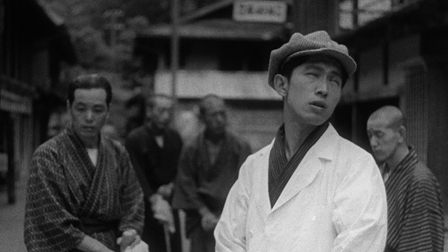 I hesitate to spoil the blast of emotional fury that sends Sunako into the geisha life, so suffice it to say that Shimizu’s startling editing in the scene shatters the gentle rhythms and redefines the film completely. The drama follows Sunako as she drifts to Kobe and back with a doting painter in tow, following her around like a puppy (played by Tatsuo Saito of Ozu’s silent comedies I Flunked, But…, Tokyo Chorus and I Was Born, But…), as she reconnects with Dora and Henry, now married in what appears to be a existence of stifling middle-class conformity. Just as interesting as social commentary and romantic tensions and yearning for lives that might have been (on both sides of the social divide) are the stylistic flourishes by Shimizu, who reveals himself to be quite modern and innovative. His most evocative touch comes when dealing with character exits from various scenes; Shimizu uses a dissolve to make them disappear before they complete their exit, as if the character evaporates on screen. The effect is subtle but affecting, creating a very different feeling absence. Be aware that the print is marked by horizontal white gouges in the image at every cut, perhaps the vestiges of deterioration in the splicing of the negative. Don’t quote me on that, though, I don’t pretend to know what caused it, only that it is a distraction that would surely have been digitally repaired in a deluxe Criterion edition. That’s the trade-off with the Eclipse line: you get fine masters of films that would normally not get such attention, but none of the expensive post-production repairs of the Criterion line. Just for the record, I think that’s a fair trade-off. Mr. 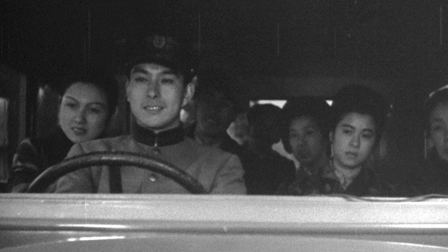 Thank You (Arigato-san) (1936) is a buoyant road movie set on a bus driving through mountain roads. The driver (Ken Uehara), named Arigato-san (Mr. Thank You) for his unfailing politeness and repeated “Thank you”s delivered to every traveler he passes along the road, is more than just a character traveling through the communities. He pauses to check in with familiar faces from the surrounding community and pass messages on, and he always has a friendly word everyone he meets. “No wonder the girls of the back roads are all crazy about you,” remakes one passenger. But the stops along the way and the conversation on the bus are also filled with stories of hardship and desperation in the depths of an economic depression. None of the girls he has taken from the mountain villages to the train station to “find work” in the city (“find work” code for being sold into prostitution) have ever returned. The young woman at the back of this bus, accompanied by her impoverished, widowed mother, is sure to be no exception. Providing commentary is a modern woman (Michiko Kuwano) in the front seat who flirts with Arigato-san, smokes cigarettes (blowing smoke-rings into the still air) and shares her liquor with the passengers, but also casts a protective eye to the girl in the back. Shimizu shot the film on location and without a script, creating the story along the way and letting the characters and locations drive the film, so to speak. The rhythms are marvelous, the score upbeat and bouncy and the traveling scenes are filled with a personal travelogue more about the people along the road than the lovely landscape of rolling hills, dramatic mountain passes and coastal views around them. Toku (Shin Tokudaiji) and Fuku (Shinichi Himori) are blind masseurs who migrate between the seaside spas in the south for the winter and return to the mountain inns and resorts in the spring and summer. The Masseurs and a Woman (1938) opens with the friends and traveling companions on the road (walking – they can’t afford the bus) to their spring engagements in a mountain vacation town, where Toku becomes intrigued by the mysterious Woman from Tokyo (Michiho Misawa), whom he places as a city woman by her scent. The simple plot involves a series of thefts where the woman is suspected, but Shimizu is more intrigued by the little moments between characters and the playful personalities of the masseurs and the folks who cross their path. As Fuku takes walks with a group of four fellow masseurs, Shimizu takes great pleasure in simply observing their shuffling locomotion and weaving trajectories and appreciates the offbeat humor of their personalities. And when a group of schoolgirls pass a group of male students trying to hide the pains from their hiking misadventures, they swap comments in call-and-response rituals reminiscent of the games and gestures from the student films of Ozu. These simple details that give the film, which runs a brief 66 minutes, its joy and personality. The culture of blind masseurs becomes part of the social backdrop of Ornamental Hairpin (1941), another film set in a mountain resort in the lazy atmosphere of summer vacation. The quiet is periodically interrupted by the noisy parade of pilgrims who hike up to sample the inn’s spring and spend raucous nights of merrymaking, much to the exasperation of the grouchy and very vocal Professor (Tatsuo Saito), but otherwise this is a life of escape from the workaday lives and wartime realities. In fact, there is no mention of the war apart from the identity of Nanmura (Ozu’s alter ego Chishu Ryu), a soldier who steps in the titular hairpin accidentally left in the spring and ends up falling for Emi (Kinuyo Tanaka), the young woman who lost the pin. She returns to help him convalesce and stays, becoming part of the marvelous community of vacationers, a generally calm group with stormy moments overcome by affection and generosity. Even the chauvinist professor, whose complaints cow many of the other guests, has a kind and considerate side and even turns into a wily little cupid, happy to make the soldier’s dream come true. It’s another film of lovely rhythms and gentle pacing that fits the pace of life in this bubble of a world, but it’s also fragile and brief. They all must return to home, except for Emi, whose home life is more troublesome. She finds new purpose and peace here and holds tight to it, giving the film a melancholy cast. The discs are in separate thinpak cases in the standard Eclipse package, which isn’t so much a box as a cardboard band that slides over the four cases. I’m not a big fan of the design, but it’s growing on me. Dave Kehr writes about the set in the New York Times here.